This is the first in a (probably) three part series. Another advertised feature of the base is control via Android and iPhone apps. Unfortunately, the Android app hasn’t been updated since 2014. I could not get it to work with my Google Pixel, and based on the reviews, I’m not the only one. Clearly, this is DIY territory. The benefits of reversing the actual RF protocol are (a) no dependence on integrated WiFi and (b) non-destructivity. Since the remote is a wireless device, it is regulated by the FCC. 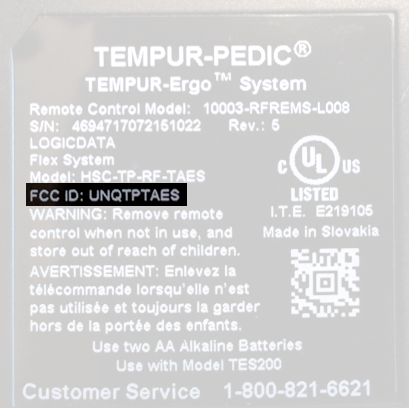 We can lookup the FCC ID (UNQTPTAES) to learn some useful information about the device. Confidentially requests by the manufacturer prevent us from accessing the BOM, schematic, and block diagram :/. In this case the most helpful document is the Test Report. Some interesting excerpts from the test report follow. One page 7, we learn there is some kind of mapping between the channel number and the frequency. The remote supports lots of channels, which could be useful for people with more than one adjustable base. Page 13-14 detail that the remote transmits in pulses, e.g. on each key press. This implies that there is no persistent connection between the base and the remote, and that communication is probably unidirectional (remote => base). Makes sense because the base shouldn’t need to talk back to the remote. In addition to being practical(-ish), I intended to use this project as an opportunity to play with SDRs for the first time. That being said, I will not try to attempt to teach any of the concepts here. The test report signal plot is overlaid on the right. We can see that the two signals are very close, so we’re on the right track. It turns out that the type of modulation in use here is Gaussian frequency shift keying. A big thanks to my friend Tim for identifying it as FSK. I got relatively far using GNU Radio to demodulate the signal (something I won’t go into here, mainly due to my lack of ability to speak on the subject). Eventually I got bored of it, and sought a faster way to reverse engineer the signal. It is tempting to try and dump the uC’s ROM and reverse the firmware, but the FCC test report from earlier reveals that ROM protection is active. Maybe next time we’ll try anyway, since PIN bypasses like this exist: https://github.com/q3k/m16c-interface. But for now, the plan is to simply listen in on the SPI bus connecting the uC and RF transceiver. This bus is used for configuring the RF chip and for transmitting the data. The Si443x’s datasheet reveals an incredible number of configurable settings: https://www.silabs.com/documents/public/data-sheets/Si4430-31-32.pdf. This traffic reveals the following details of the modulation scheme. Note that in this case, my remote was set to channel 9345, which is how it came delivered. 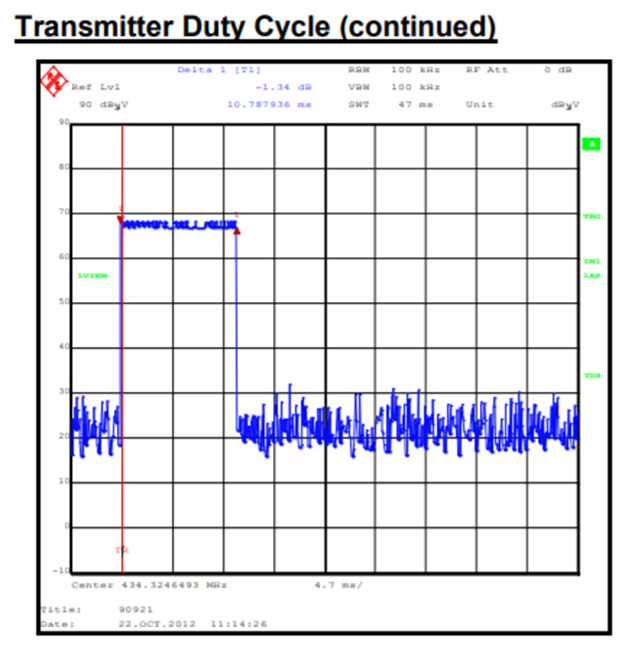 Nominal carrier frequency is another term for the center frequency. 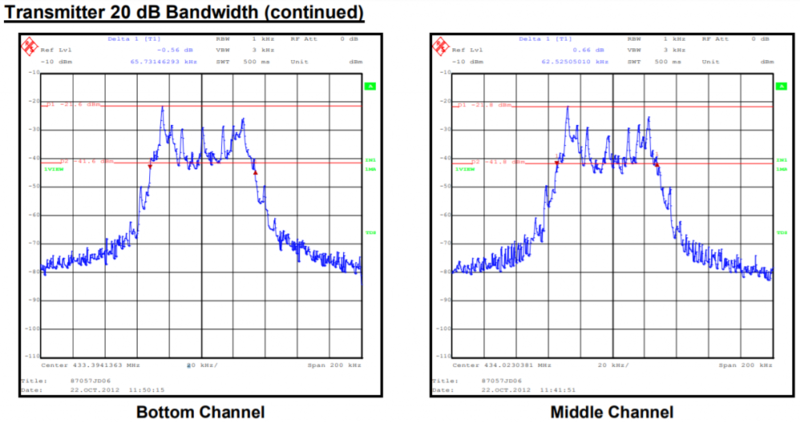 Therefore, channel 9345 occupies ~[434.585 MHz – 25 kHz, 434.585 MHz + 25 kHz]. 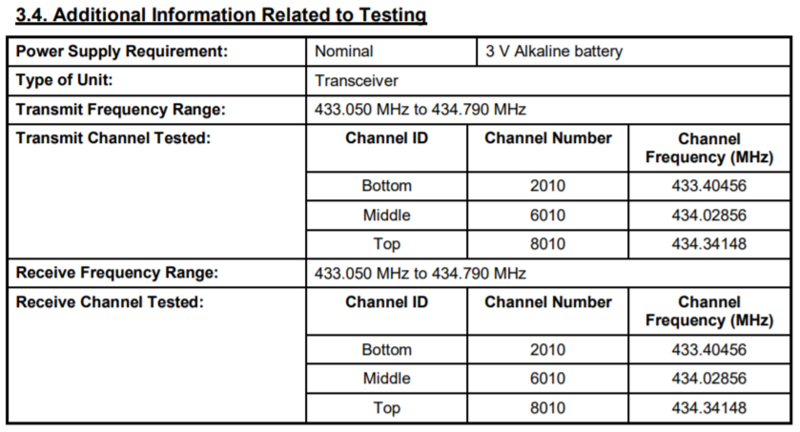 So how does the remote get 434.5856250 MHz from “channel 9345”? This is a question I wrestled with for about 2 days. There is no easy linear relationship. I collected a few dozen initialization sequences, each time with a different (random) channel number and looked for a relationship. That portion highlighted in red corresponds to the fc (frequency center) register in the Si443x. So, when the user changes the RF channel, all the uC has to do to tune the transceiver is change the fc register. The Si443x has a neat feature that lets you do channel-tuning from a single channel select register. 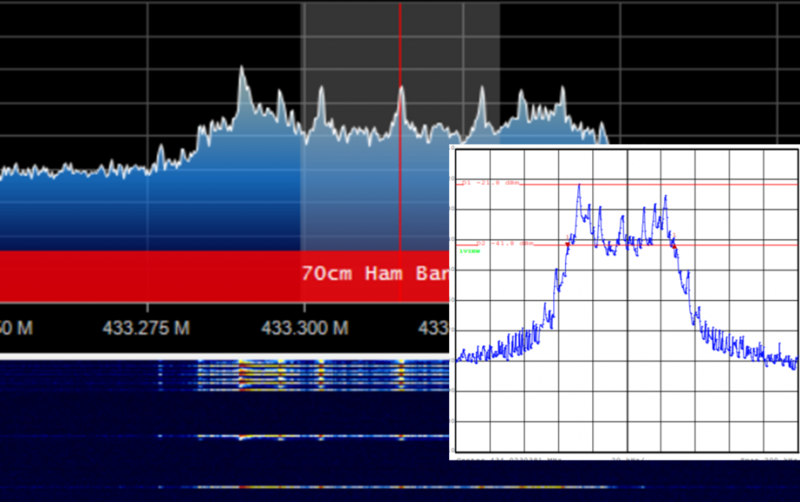 You first set the nominal carrier frequency, then the channel step size (increments of >= 10 kHz). It’s generally used for timing critical applications like frequency hopping. So why didn’t the Tempurpedic remote use it? Since the system supports 9999 channels, the 10 kHz channel step is way too big. The remote’s channel scheme uses ~156.2 Hz channel step. Recall that we’re dealing with burst communications. This means that the receiver will always need to be ready and listening for data. How can a device like this remote control do so in a power-efficient manner? Answer: Combination of preamble (to “wake up” the receiver) and a sync word. The preamble is designed to be both “easy” to detect and something that is unlikely to be received randomly. A common choice is an alternating series of 1 and 0. The Tempur-Pedic remote uses this sequence, 40 digits long. The preamble detector may wake up the transceiver in the middle of the preamble. How can it know where the data actually begins? This is what the sync word is for. 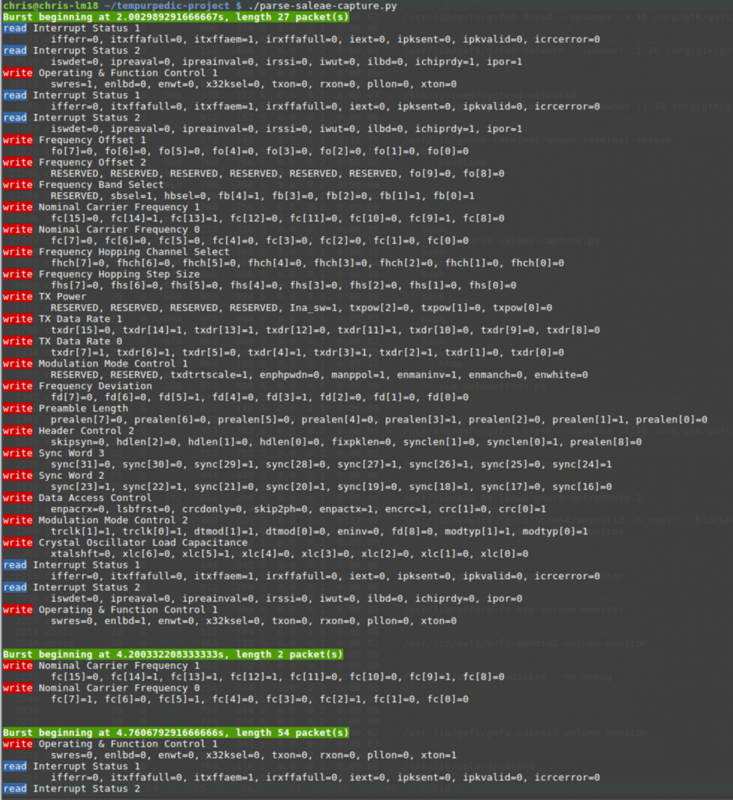 After detecting the preamble, the receiver searches for sync word for a (configurable) period of time. The Si443x can operate in fixed or variable length mode. In our case, the remote uses variable length mode, even though all of the data I’ve seen come from it is the same length. So, we’ll need to handle the packet length header. 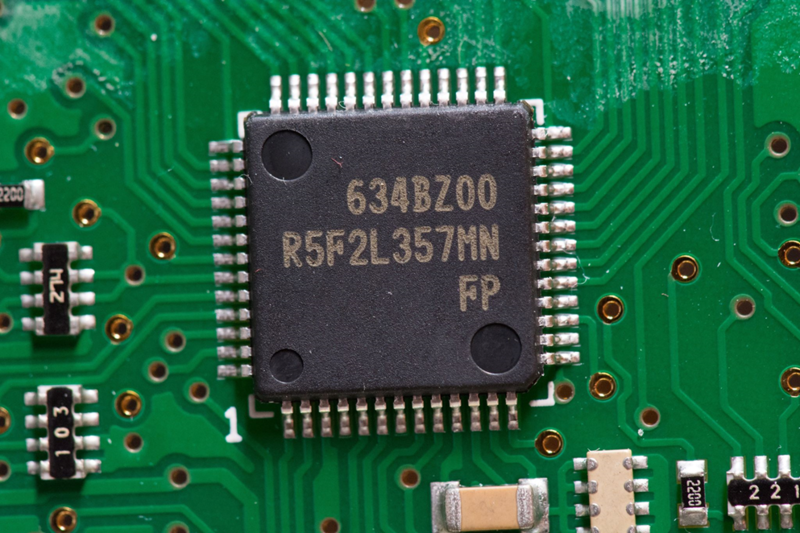 The CRC is a sanity check to detect transceiver errors. It’s handled transparently by the Si443x. It’s finally time to investigate what data is actually sent by the remote. Here’s an excerpt of the table I used to decode the protocol. I tuned my remote to various channels and pressed each button. The next three bytes are independent of channel, dependent on command. But what about the last part? There is no obvious correlation between neither the command nor channel. The “name=(none)” part means that this set of parameters doesn’t correspond to any well-known CRC. Recall that the Si443x already has its own CRC. Why does the remote use another one? My best guess is that the engineers chose to add this application-level CRC to guard against data corruption between uC and transceiver. For example, suppose some noise on the SPI bus caused the transceiver to “see” different data that what the uC intended to transmit. The transceiver has no way of knowing this, and so it will dutifully transmit it. The receiver in the base may or may not recognize the corrupted command. 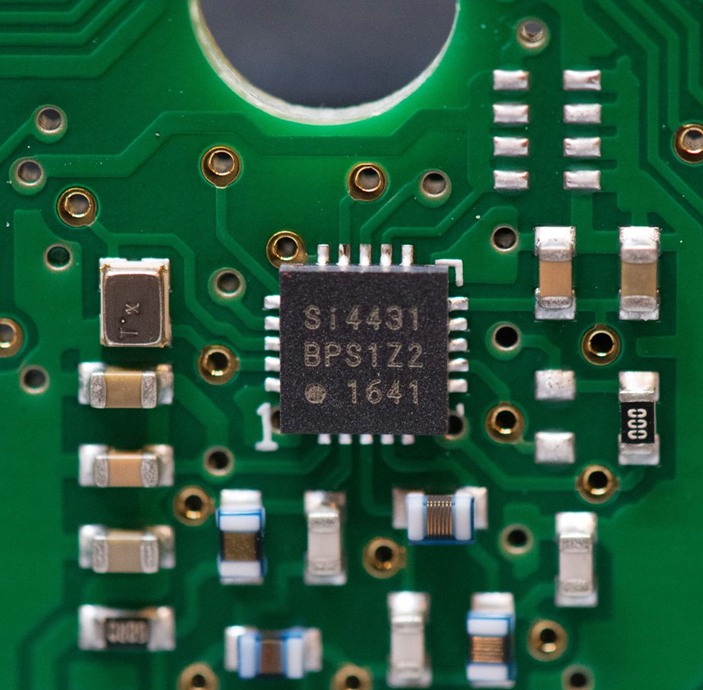 An application-level CRC ensures transmission errors on the SPI bus can be detected. Most of the buttons on the remote don’t seem to be debounced. For example, when pressing a command like STOP or FLAT, the remote will actually transmit it between one to three times (in my experience). This is a good thing, since it increases the probability that the receiver actually receives the command. Those types of commands are idempotent, so even if the base does receive multiple of the same, it doesn’t matter. Buttons that are meant to raise/lower the legs and head are intended to be held down, which causes the respective command to be repeatably transmitted until the button is released. The massage buttons are an interesting case. These six buttons increase/decrease the massage intensity of the legs, lumbar, and head region. Initially I had expected that they would be implemented using one command per button, just as the leg/head raise/lower buttons. But in fact, it is more complicated. There are eleven massage levels, between 0 and 10, with 0 being off. The remote control keeps track of the current massage level for each region. When the user hits the “+” or “-” button, the remote transmits a massage command that encodes the region and the new level. In other words, it transmits the absolute massage level. This means it actually 33 discrete commands to implement the remote’s massage buttons (11 levels * 3 regions). Contrast this to the leg/head raise/lower buttons, which merely transmit relative positioning commands (either “+1” or “-1”). So why does the massage feature have this complication? Here’s my theory. From the previous section “Command bursting”, we understand that the remote transmits commands multiple times to improve the probability that they are received correctly. This is fine for idempotent commands like STOP, FLAT, etc. It’s also fine for buttons that raise/lower the heads/legs since their positioning is so granular that the user probably won’t notice the difference between a button press that raises their legs 1 step or 3 steps. But since the massage only has 11 levels, the user would definitely notice if one press of “Lumbar message increase” added +1 to the level whereas the next added +3. A mildly interesting feature of the system is the ability to automatically choose a channel. To do this, you press and hold the FLAT and STOP buttons for ten seconds, then press the STOP button. The remote’s LCD will blink while displaying the new RF channel. While it is blinking, you unplug and then replug the base. If done properly, a relay in the base will click to confirm the new channel has been learned. While the remote is blinking the new channel, what it’s actually doing internally is transmitting the channel number on a special broadcast channel 5568 (fc = 25088, frequency = 433.9200000 MHz). Presumably, the base listens on this channel immediately after being plugged in. Side note: A limitation of the system is that the RF channel is chosen purely randomly, and although there are 9999 possible channels, collisions are possible. With the protocol understood, I sought to build a receiver that could decode commands from my physical Tempur-Pedic remote. I chose the following Si443x transceiver breakout for prototyping: https://www.tindie.com/products/modtronicsaustralia/rfm22b-wireless-breakout-board-800m-range/ ($22.95). Eventually I am actually going to switch to the Si446x (example breakout), since the Si443x is end-of-life. The microcontroller I am using is the ESP32 ($21.95): https://www.sparkfun.com/products/13907. It is the perfect choice because it supports Bluetooth Low Energy and WiFi, one/both of which I’m planning to use for the next part of this project wherein I build my own Android app for controlling my base. I will be posting more details on it soon (hopefully). The receiver code is nearly feature complete, so next I will be working on the transmitter portion. After that, I will be working on the Bluetooth Low Energy interface and an Android app. Fantastic job here. I love to see detailed reverse engineering like this. Despite being a ham, I’ve only messed with the RTLSDR, but seeing a waveform is completely different from decoding that waveform, especially in light of all the different modulation schemes. Newer devices are even harder, smaller, have newer chipsets, more integrated designs, and so on. I was glad to see you go the logic analyzer route, because it seems to make it a lot easier. I enjoy doing that, but there can be challenges there too, so I appreciate the hard work and the sharing with us!! I’ve been working on-again/off-again on reversing a sega genesis Z80 communication to the Yamaha sound chips. Thanks again for sharing and great job, very interesting!